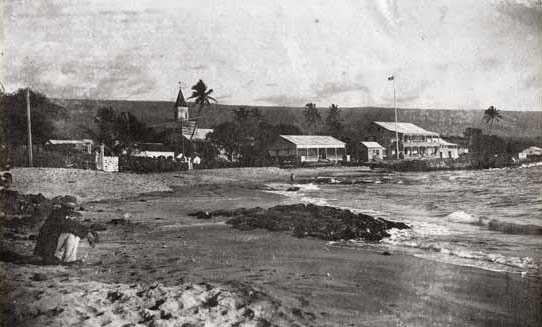 The King allowed the British Royal Society’s expedition to set up three sites in the Islands, Honolulu’s waterfront in a district called Apua (mauka of today’s Waterfront Plaza,) Kailua-Kona at Huliheʻe Palace and Waimea, Kauai. The mission of the British expedition was to observe a rare transit of Venus across the Sun for the purpose of better determining the value of the Astronomical Unit – the Earth-to-Sun distance – and from it, the absolute scale of the solar system. Then, the fateful day … not December 8, 1874 (the date of the Transit of Venus) – rather, November 20, 1874 when tragedy struck. On December 8, 1874, the transit was observed by the British scientists; however, the observation at Kailua-Kona was interrupted by occasional clouds. The Honolulu and Waimea sites were considered perfect throughout the event, which lasted a little over half a day. Perhaps as a result of the King’s interest, a telescope was purchased from England in 1883 for Punahou School. The five-inch refractor was later installed in a dome constructed above Pauahi Hall on the school’s campus. The image shows a calmer day in Kailua Bay. (ca 1890) In addition, I have included other related images in a folder of like name in the Photos section on my Facebook and Google+ pages.